Life is a complex system controlled by the interactions of tens of thousands of genes and proteins. The advancement in technology today allows rapid sequencing of whole genomes providing for the first time a data set that requires the development of new analytical techniquesby projecting the life sciences in the Big Data universe. This approach requires multidisciplinary research platforms and researchers with a high level of knowledge of the potential and limitations of each available method, in order to always make the best choice to identify among all the signals the most biologically relevant ones which have the potential to reveal new mechanisms. 1. Dr. Mario Rosario Guarracino (CNR, Italy) ?? 2. Dr. Husna Nugrahapraja (ITB) ?? This course covers Basic of R Programming. 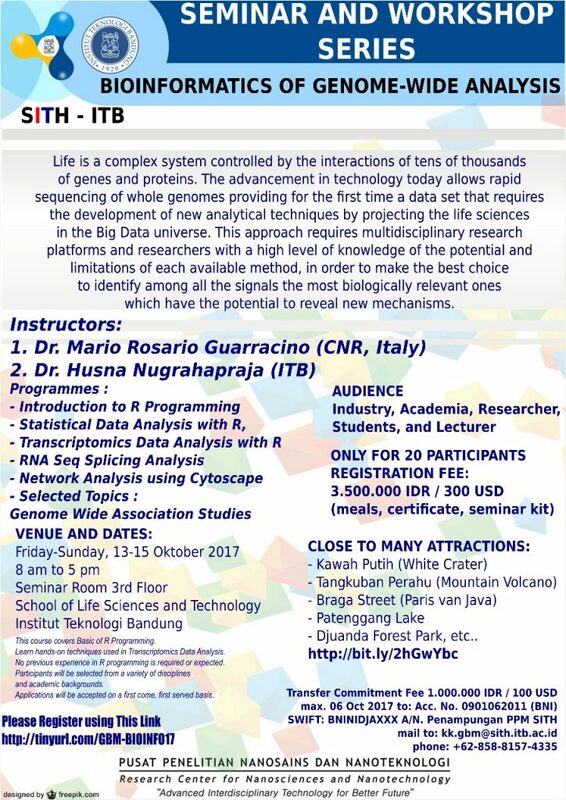 Learn hands-on techniques used in Transcriptomics Data Analysis. No previous experience in R programming is required or expected. Participants will be selected from a variety of disciplines and academic backgrounds.
? https://goo.gl/forms/0FIZtvT1E8BPvn5r1 ? / ?